Interaction Design Jobs – what is Interaction Design? This entry was posted in DES134 Interaction Design Techniques on April 15, 2014 by Anthony Hutton. It tells a story – The story can be read from any of the 12 starting points depending on the readers point of view/interest. No matter where they start from the Navihedron still makes sense. It is dynamically updated – content streaming from the web constantly updates the Navihedron. It is not a fixed content entity. Drag and Drop – You can drag your own content in to a point and drop it there as a Nav point. Relational – When you create the Navihedron you set the relational rules. Jump from one point to the next point only or jumps allowed to points deep or jump to anywhere (no rules). 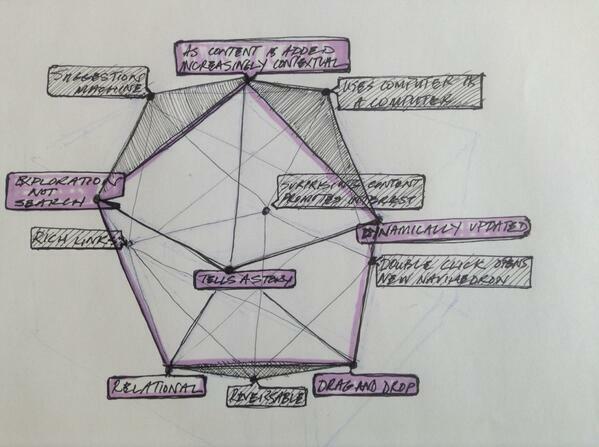 Exploration not search – The Navihedron allows a user to explore interactively – in that sense it differs from a Search. As content is added the Navihedron increases in Context – The Navihedron responds by updating itself when the user adds a new Nav point. Suggestion Machine – The Navihedron is a suggestion machine – constantly giving you content suggestions. This entry was posted in DES134 Interaction Design Techniques on March 18, 2014 by Anthony Hutton. This entry was posted in DES134 Interaction Design Techniques on February 25, 2014 by Anthony Hutton. Describes the envisaged use case scenario (x3). Who uses the Navihedron site and why? What benefits do they get by using the site? 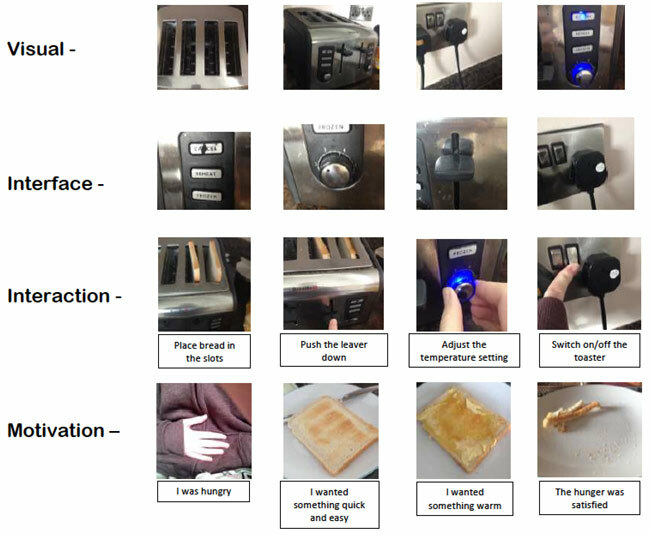 Interface – What do you touch? A list of all the buttons, sliders and interface elements with a short functionality explaination beside each item. Upload, edit, save, move, copy, add text to navi, choose colour. (PDF). Interaction – What do you do when you use or read the navihedron? 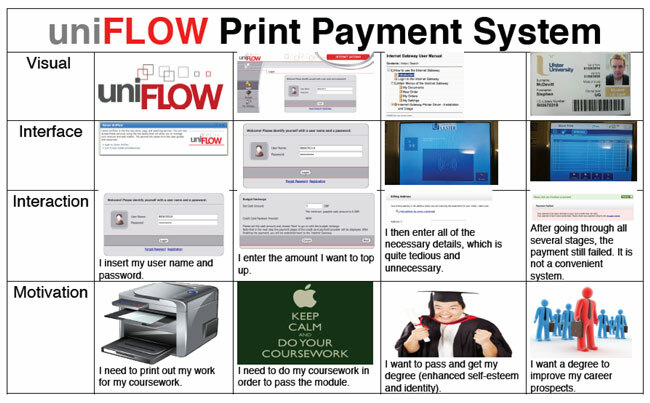 What are the main functions of the site – what tasks are achieved. This could build upon the Interface spread. A short explanation beside each function: Create element, add element, edit, browse, search? Motivation – What is the the use case for your Navihedron. Explain the benefits for the person who makes the Navihedron and the people who read the content. why would the user group (from your scenario) use the Navihedron? Description of steps required to finish the project and launch. What team would be required to complete the project? How would first 100 customers be acquired? How much do you think it would cost to build? How might the project be monetized? This entry was posted in DES134 Interaction Design Techniques on February 4, 2014 by Anthony Hutton. 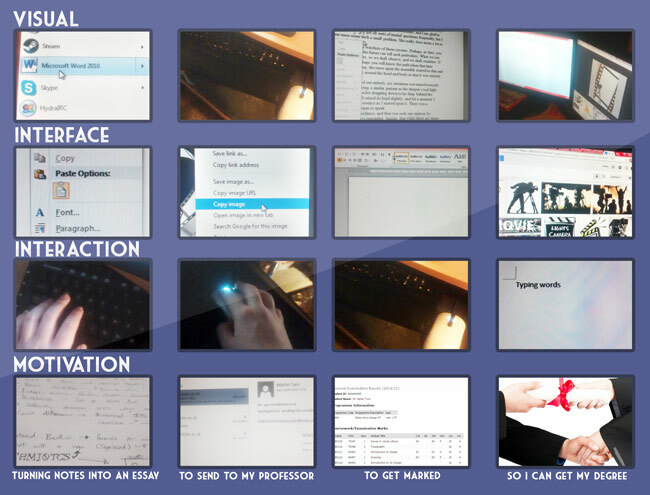 In this module the idea of Interaction Design is introduced. There are a number of possible approaches to this. The approach that we will pursue is one where we dive straight into the problem of building something. By building something and developing skills we will develop the tools and skills to think about Interaction Design. The idea behind this is that you need a certain amount of skill and technical ability to be meaningfully able to design and work in Interaction Design. Once some building skills are gained then we will start looking at broader design problems. In 1998 Roy Stringer promoted the idea that an icosahedron (12 vertices’s, 20 edges, 30 surfaces) could be effectively used as a navigation system to present non linear content. Each point of the icosahedron which Stringer called a Navihedron would be a subject heading. Each point can be clicked. Two things happen when a point is clicked; 1. The Navihedron animates bringing the clicked point to the frontal position, 2. content relevant to the clicked point subject heading appears in a frame or content area located adjacent to the Navihedron. Its a very pleasing effect. The animation is engaging. The viewer can revolve the Navihedron exploring the 12 points. They can click on the point heading they are interested in. That point is the start to their story. Each point has five geometrically related points that offer the next step in the story. The viewer can create their own path through the story. It allows users to browse and gather in a natural way and yet remain within a cohesive story. In comparison linear presentations seem rather boring. The key to it may be that the reader can select their own entry point rather than the start of a linear story. Once they have selected their start they can control their own story rather than being directed through numbered pages. When Stringer first presented the Navihedron he used Shockwave. 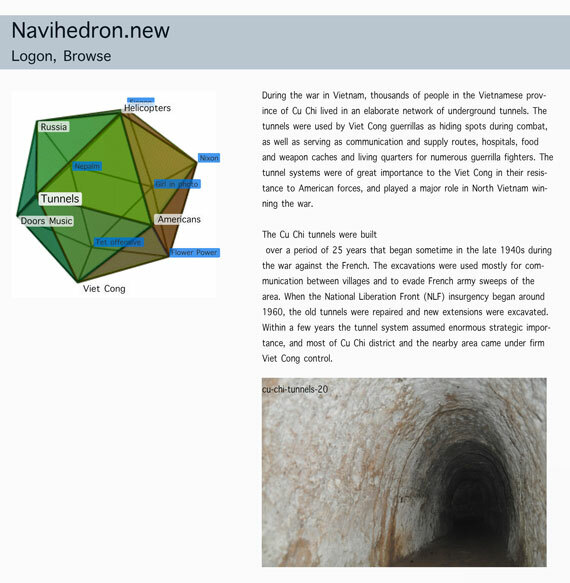 By signing on to the site user could build their own Navihedron and edit the headings. The finished Navihedron could be exported and then used in a stand alone website. Stringer was inspired by Ted Nelson who in 1965 first used the term “hypertext” to describe “nonsequential text, in which a reader was not constrained to read in any particular order, but could follow links and delve into the original document from a short quotation”. Nelson says that HTML is what they were trying to prevent in project XANADU. “HTML has “ever-breaking links, links going outward only, quotes you can’t follow to their origins, no version management, no rights management”. Roy Stringer died very young in 2000. Although his work had huge impact, somehow, Stringers Navihedron Site has disappeared from the web, actually it has fallen victim to what Nelson quips as a world of “ever-breaking links”. In fact I could not find any working Navihedron. Perhaps there is something in Stringers Navihedron work that has been superseded by the all pervading paradigm of web based navigation. Menu at the top, sub menu down the side or dropping down. Top nav bar, side nav bar, drop down, floating palette has become dominant. Stringer was one of the co-founders of AMAZE. In Amaze today it is hard to find any particular reference back to any alternative navigation method other than the dominant. Perhaps the finished website could look a bit like this. We will need a method to annotate each of the vertices’s with a label. Each label should be linkable to a content area. Ideally the isocohedra should be drawn and animated so that the foremost pentagon is emphasised. The vertices points behind the foremost pentagon should be faded and or smaller. Each Navihedron needs to be editable according to an account or folder. How can each Navihedron be made editable? When the editable animated Navihedron is made we need to link it to a content display area. This entry was posted in DES134 Interaction Design Techniques on February 2, 2014 by Anthony Hutton.